Here is a 15 min. 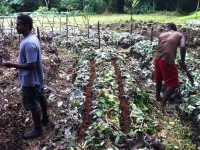 YouTube presentation at Savusavu Agriculture Deptartment on Organic Farming in Fiji. Understanding the problem is the first step for changes. The transformation of my mind and awareness here in Fiji has been miraculous, to say the least. A rather bizarre sequence of events landed me in Fiji with all expenses, flight and accommodations paid at a luxury resort, in exchange for giving a short presentation on resilient living. It went well and I made some great friends in the process. After a week of hanging out with some very nice people, I moved to the small village of Sovendondro. It was here that I began my daily treks into the forest with my friend Pana, a veteran of the Fiji Forrest Service, and an incredibly knowledgeable source of the local fauna and flora. It was on one of these days that my “Fiji Bubble” got popped and the whole pristine paradise image that I had just evaporated. One of the local villagers was leaving his field, carrying a backpack sprayer with something green sloshing around in it. When Pana told me it was Paraquat defoliant (think Roundup/Agent Orange) and that it was used to kill the tall invasive grasses in the flat areas under cultivation I became very troubled, and was so all that day. During sleep that night I had one of my “movie visions” and in the morning I began sharing it with the villagers and there was quite a lot of excitement because of this. So, I was taken to somebody’s uncle (everyone is related to someone), who was the head of the agriculture department in Savusavu district, Vanua Levu Island. We sat, and I told him this vision. How I speak to the farmer: You cut the grass and set it to the side to dry. 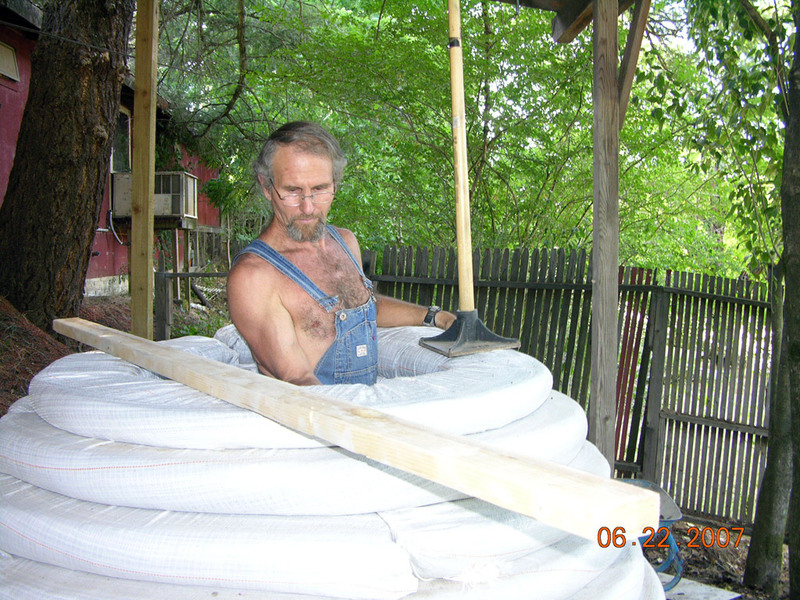 You put posts in the ground and put wire on the posts and attach a small, inexpensive electric charger. You put the goat in the area and it will eat the grass down to the root. The goat will touch the wire a few times and the goat will stay away from the wire in its area. Move the goat into the next area, one charger will do 5 miles of fence, so do several sections in this manner. Then you take the taro stem, that’s left after we eat the leaf and the root, and cut it into chunks and ferment or boil it. The pig likes this. 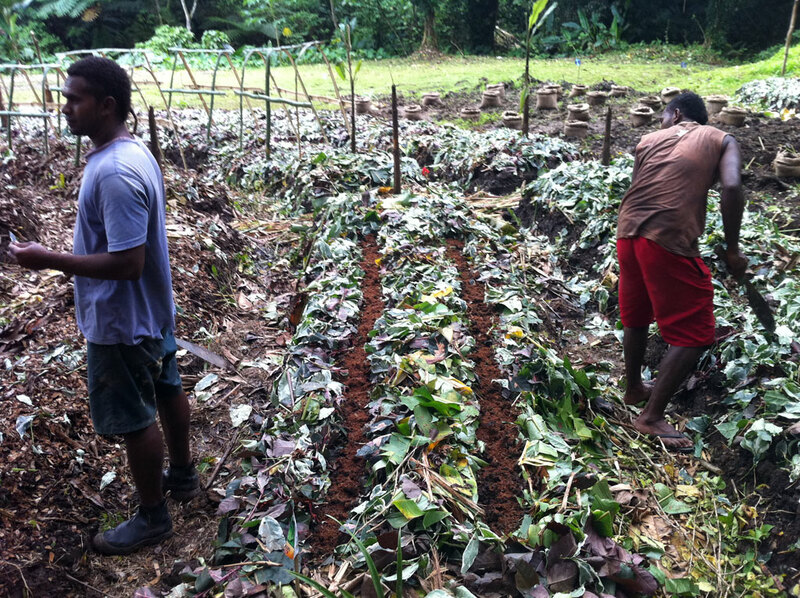 You go through the field with a wooden staff and stick, plant, stomp, stick plant stomp your chunks of taro stem into the ground. The pig has a nose like a shovel, and he likes to use it to rout up his food. Put the pig in the area and he will rout up the entire field and the roots of the grass with it. The pig will go into the wire once, and only once… because the pig is smart! You move the pig into the next area and you move the goat into its new area and continue this process. You go into the field that the pig routed and rake all the roots into piles and burn them and spread the ash with all the manure that the pig and goat left you. You take the dead perennial buffalo grass (Urochloa mutica), which can grow to heights of two meters, and mulch the field. 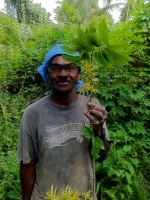 Plant the wide leaf low canopy taro, with the high canopy cassava in between and grow the wide leaf pumpkin on the outside edges and train it inward. Any remnants of grass will be deprived of light and nutrients and the field will be free of grass and will need little added labor until harvest. The animals will have done most of the work. You will have the added value of pig and goat products and most importantly, you will not need Paraquat. Living in Sovendondro Village for three weeks has been quite helpful in my understanding of the Fijian culture. This has, and will probably continue to serve me in applying what knowledge and insight I am blessed with. Kava and the Kava ceremony are prominent features in Fijian society, and it contributes its burden of late night and later morning activity among the male populace. The Fijian women on the other hand are up before the sun and are cooking and getting kids off to school and moving the family ahead in any way they can. I was very impressed with how industrious and resourceful they were. Fijian’s are not into goats, however I believe they would be if there was an incentive. As I see it, if they are provided with a milk goat, the men would handle everything but the milking. If the women were trained in milking and handling the milk, someone would come around the villages with a truck and pick up milk in the morning and evening and pay them Fiji dollars. This milk would be brought back to the business and it would be boiled and processed into feta cheese. The local resorts would be very accommodating, neighbors and family members would want to get ahead and eventually the local market would get saturated. This is where it could go international as “Fiji Feta”. Fiji is no different than anywhere else in terms of economics. If something makes economic sense, people want to participate. The “Air Yam” (Dioscorea bulbifera), is a “gift” (plague) introduced by the military during WWII to camouflage their weaponry. 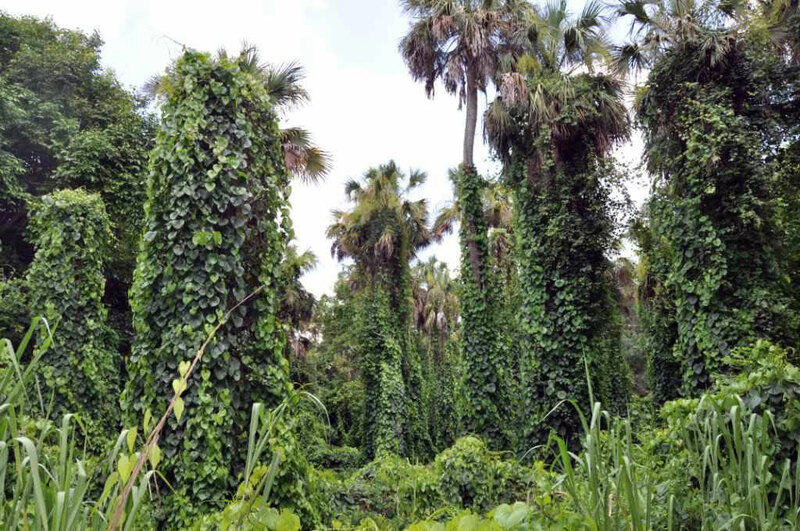 It chokes out the sun and it robs nutrients at the base of the host tree, bamboo or bush. It is a real scourge and it just keeps getting worse. As I see it, this plant has a high potential as fodder and green waste. In permaculture, your problem becomes an asset. By laying the vines on 30″ x 50″ sheets of agricultural plastic, sprinkling it with EMI inoculants (www.emearth.com), rolling it into a burrito and depriving it of oxygen for 10 days, it will ferment. It will be neutralized and will be available as a feed or mulch. Pigs, goats, cattle and fish could possibly do well with this as a food source. If not, it will be great as partially decomposed green waste that will release nutrients back into the soil every time it rains (time release fertilizer). If it tests well for palatability, I’d like to get a nutritional analysis. A positive analysis could lead to a very positive trend for Fiji. A small, low-tech business model could be developed that would be a real win/win for Fiji, and any investors that would like to take this one on. The following is an exercise in “Focus on Fiji”, an addendum to work that has been submitted over the last two months (since June 20th). This is a theoretical model that can potentially be applied to those riparian areas that were mentioned in the “Day 30 Food Production Proposal”. 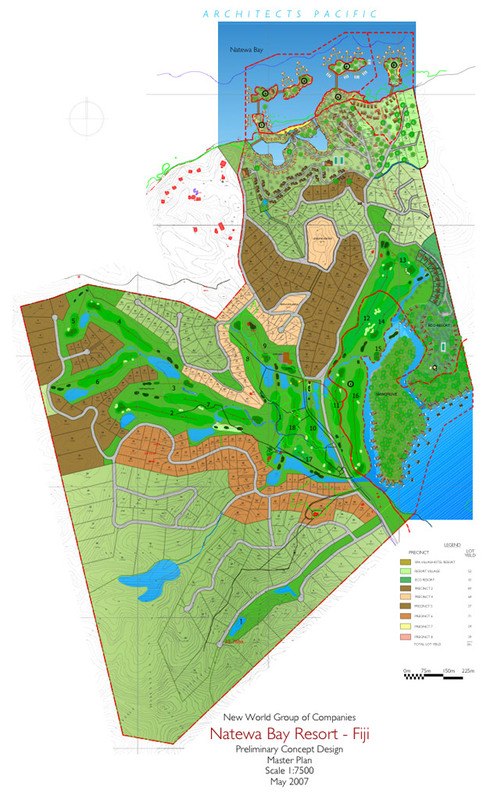 There is a map attached (Master Plan Eco Community) for your convenience. The Blue Tilapia is my choice for this model because of it’s herbiferous (vegetative consumption) nature, as it applies to our specific geo climatic realities. Culturing our own feed for this type of fish is quite doable. It is no secret that they do well with photo plankton (algae) as their primary source of nutrition. They are also a reasonably easy fish to grow, with few problems that are so often associated with other species. Animal and vegetative waste, sun and water will give you a whopping 55.5% crude protein, 7.5% fat, 17.8% carbohydrate and 8.25% ash when you process it through Chlorella (unicellular algae). Copra meal (21% protein, 5% fat, 47% carbohydrate, 7% ash and 13% fiber is also a consideration. It has fiber that algae is lacking, but because of it’s high processing to volume investment it is best suited as a duck and chicken feed. The algae will process the waste and the tilapia will consume the algae, therefore, I believe a comfrey/copra meal base augmented with a low percentage of cultured yeast and blood meal will cover all the nutritional needs of any tilapia or prawns that we grow without leaving the farm, “no commercial feed necessary”! If you look closely at the lower section of the attached map, you will see two bodies of water close to each other, with a thin green area at elevation below to the right of it. There appears to be ample hillside elevation here for consecutive terraces of rice, water chestnut watercress and water conditioning cisterns. Without aquatic plants in the main bodies of water (algae only) mature fish can be herded with nets through slue gates into a downward migration through these areas to fertilize prior to planting rice, Chinese water chestnuts and water cress. Ducks and geese can be used to augment fertilization, while eliminating the mosquito/insect populations. Other animal waste and vegetative material such as comfrey that grows up to 115 tons per acre, sweet potato leaves and slosh from our livestock can feed our tilapia directly in their original forms, or indirectly when processed through algae. In China, prawns have been used successfully in removing stubble after rice harvest, and they can be seeded in our terraces for this purpose. The lower flats (in green) look ripe for rain diversion canopies, with gravity fed conditioned pond water and lot’s of green manure. I believe that this moisture-saturated area has the capacity to serve us in an entirely different agricultural modality, if the recommendations that I have made are followed. This same process can be applied to the larger body of water on the map.